IN broad daylight on a bustling Quetta highway this week a white ute screeched to a halt in front of a bus carrying mostly poor Hazara fruit sellers to a market. Heavily-armed men, suspected members of the Punjab-based militant group Lashkar-e-Jhangvi, spilled out of the vehicle and boarded the bus from the front and rear doors. Those passengers who did not bear the unmistakable Asiatic features of the Mongolian-descended Hazaras – adherents to the Shia Islamic sect – were allowed to leave. The remainder were shot with AK-47s. 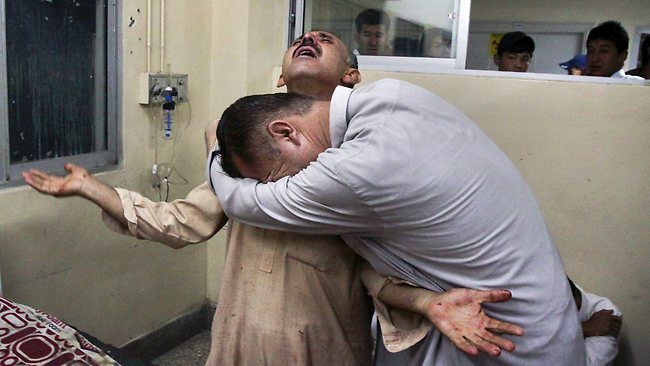 Fourteen died on Tuesday, just three days after Hazaras gathered in cities across the world – including Melbourne, Perth, Adelaide and Sydney – to beg for international action against the almost-weekly targeted killings by Sunni terrorists in Pakistan’s Balochistan province. Not for the first time, their pleas fell on deaf ears. Such is the level of violence in Quetta now that no ambulance would respond to Tuesday’s emergency. Instead the traumatised bus driver ferried his bloody cargo to the door of Quetta’s Combined Military Hospital, where devastated families gathered to identify the latest victims of this ethnic cleansing. Yet the plight of the Hazara community has become little more than a footnote in the decade-long counter-insurgency battle being waged by NATO and coalition forces across the border in Afghanistan. The Australian government officially re-evaluated the assessment process for Hazara refugees last year and signed a memorandum of understanding with the Afghan government in January, enabling the return of rejected asylum-seekers. With the removal of their most brutal persecutors – the Sunni Afghan Taliban – from power, life in Afghanistan has improved for the historically persecuted tribesmen. It could scarcely have got worse. But the persecution, kidnapping and targeted killing of Hazara people is still a reality. And in Pakistan – where millions of Hazaras fled in the wake of the Taliban’s rise to power – the situation is increasingly desperate as Sunni militants pursue their campaign of ethnic cleansing with seeming impunity. Human Rights Watch has recorded at least 16 attacks on the Shi’ites so far this year. Local leaders say at least 600 Hazaras in Pakistan have been killed since 2007 and more than 1500 injured. Pakistan’s Human Rights Commission has warned that the latest strike “exposes once again the diminishing writ of the state”. A fortnight before Tuesday’s attack – the week the Australian government returned a rejected Hazara asylum-seeker to Pakistan – 29 Hazaras were killed in a strikingly similar attack on a bus of pilgrims 30km outside Quetta. It was the deadliest attack on Shias in Pakistan since September 4 last year, when a suicide bomber killed at least 57 people at a rally in Quetta. “Continued sectarian bloodshed across the country is a direct consequence of the authorities’ perpetual failure to take note of sectarian killings in Quetta, which have been going on for many years,” the Human Rights Commission said this week. It said the killers had been emboldened by a persistent lack of action against sectarian militants, which have been implicated in thousands of deaths in past years. Indeed, several Pakistani television talk shows claimed this week that the LeJ aimed to run all Hazaras out of Pakistan by the end of next year. The group, formed during the military regime of General Zia ul-Haq, was banned after the 9/11 attacks on the US but has since been linked to several major attacks, including the 2008 Islamabad Marriot hotel bombing and the 2009 assault on the touring Sri Lankan cricket team. The escalation in violence against Hazaras appears to have coincided with the release from prison of LeJ leader Malik Ishaq, jailed in 1997 on more than 50 terrorism and murder-related charges but released on July 15 for lack of evidence. Ali Dayan Hassan, Pakistan analyst for the New York-based Human Rights Watch, says despite the rising violence there has been no discernible crackdown on the Taliban and al-Qa’ida-affiliated LeJ, which claimed responsibility for last month’s attack. Balochistan has been wracked since at least 2004 by militancy and a regional insurgency waged by separatists demanding political autonomy and a greater share of profits from the region’s wealth of natural resources. Religious sectarian violence across Pakistan is also on the rise, with numerous attacks on Ahmadi, Shia and Sufi shrines and celebrations. But no community has seen a more dramatic rise in violence than Pakistan’s 700,000-strong Shia Hazara community, a good proportion of which had fled the brutal persecution of Afghanistan’s Sunni Taliban regime. In Australia, refugee advocates are tracking the violence on both sides of the Afghanistan/Pakistan border with mounting despair. “The vast number of Hazaras we have been talking with over the years are based in Balochistan. They went there because Afghanistan was not safe,” says Phil Glendenning, from the Edmund Rice Centre. “Now Balochistan is not safe, Afghanistan is not safe, and the Australian government needs to pay considerable attention to this. Under growing pressure, the Pakistani government has rounded up more than 100 suspects in recent days but there is little confidence the culprits will be captured. These are questions being asked by fearful Hazaras across Pakistan. “I don’t want to leave Pakistan. My family has been here since before 1947 (partition) and we are Pakistani citizens but things are now so bad I am scared to leave the house,” says Altaf Hussain Safdari, a bachelor of science and IT student who runs the Hazara Nation website and a Hazara community station Mechid TV from his Quetta home. The 27-year-old can no longer attend classes because his university is located in a Quetta suburb now considered a no-go zone for Hazaras. Instead, he spends his days documenting attacks and abuses against his community. Hi, it’s a question for Safdari, I was wondering if I could have those pictures. I’m working on my speech about Hazaras, in my school. If possible could you send them to my email address.